As we approach the Independence Day holiday, it’s a good time to talk about safety. I had the opportunity to participate in the 2nd Annual PDOT Safety Summit earlier this week. It’s a great event where citizens can interact with PDOT staff and other agencies to brainstorm how to make life safer out on the streets. But today I want to celebrate our successes in this area. 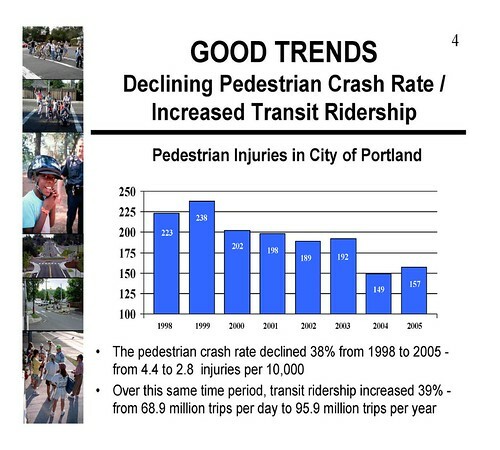 Here are a few slides from the opening presentation demonstrating that it is in fact getting safer out there. 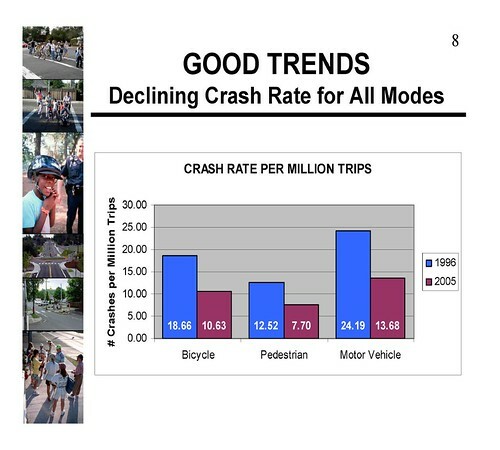 I’d particularly like to point out that on a trip-by-trip basis, it’s safer to walk or bike than drive! I know someone will point that it’s probably not so on a mile-by-mile basis, but hey, that’s just one more reason to organize your life so you can take shorter and less auto-dependent trips for your daily needs. Enjoy the 4th and be safe. I have no idea what the background on this is, but Peter and Michael Bloomberg seem to be sparring. 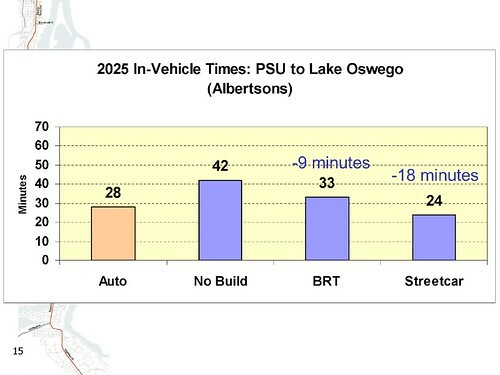 Last Thursday, the steering committee overseeing the Lake Oswego transit alternatives analysis got an update on the evaluation of alternatives. 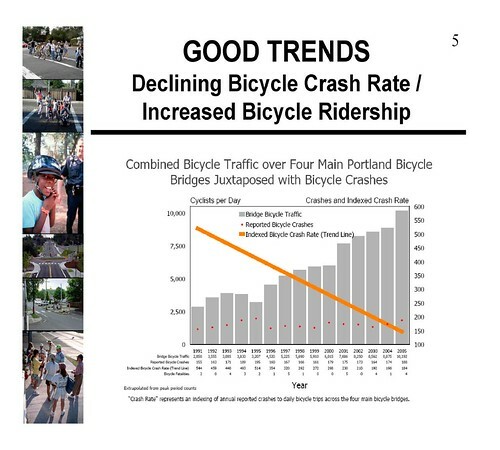 I’ll hit the highlights below, but the full presentation is here (PDF, 3M). There are also some visual simulations that I will post later when I receive them. To get involved in the process, you can attend two open houses next week, and a formal public hearing on July 16th. Details are on our calendar. The first interesting piece of data in the evaluation is that Streetcar has the best travel times among the alternatives due to the availability of dedicated right-of-way. Even with queue-jump lanes at intersections, BRT gets stuck in congestion on Highway 43. In fact, Streetcar travel times are better than auto travel times, even with the more conservative total travel time measure (versus in-vehicle time). 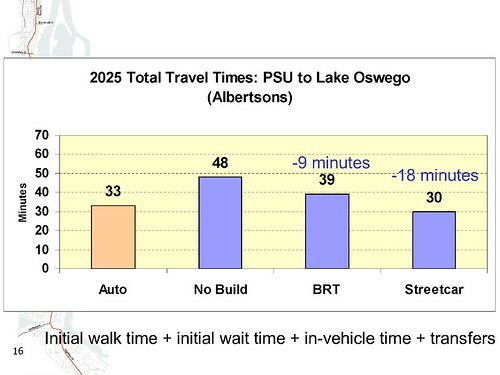 This is one of the few corridors in the region where transit beats autos on total time. 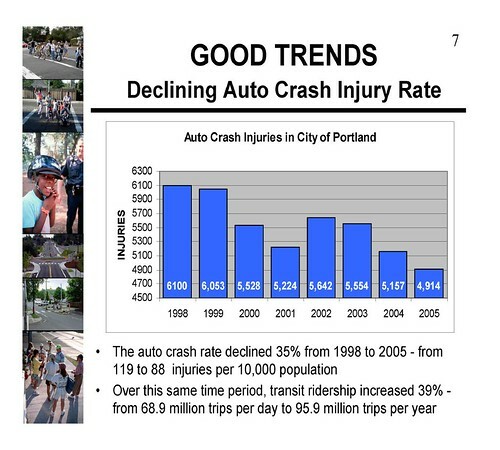 There is an interesting question the steering committee will need to grapple with that doesn’t appear on the slide. If the alternative chosen is to run in Macadam through Johns Landing – avoiding the political challenge of running next to the existing condos and likely contribution to a higher development potential – the price is several minutes in travel time. 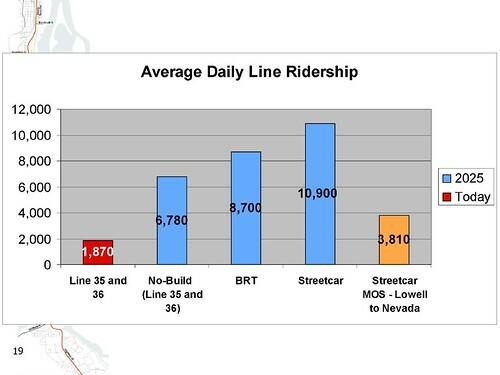 Streetcar also appears to have the highest potential ridership. Abandon the Streetcar and get a relatively inexpensive trail, but ONLY if it turns out that the easements will hold up legally without rail use – a very debatable question. 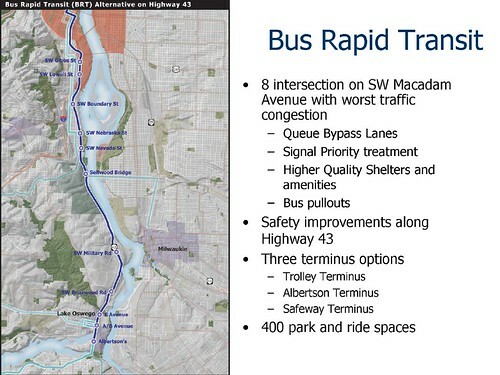 This option also abandons the $50M value of the right-of-way as a potential match against Federal funding for a rail project. Bore a very expensive additional tunnel through the Elk Rock. Put Streetcar stops at either end of the tunnel and let hikers and bikers board for the segment under the rock. 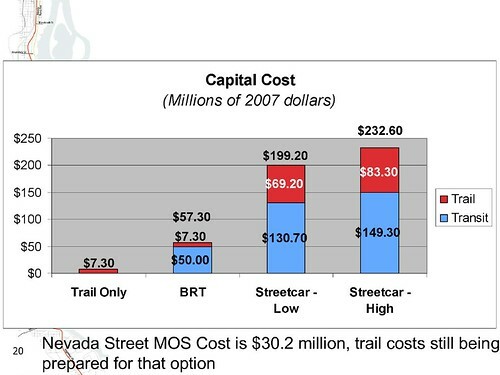 While Streetcar has higher initial capital costs, lower operating costs make it less expensive than BRT over a 20 year horizon. 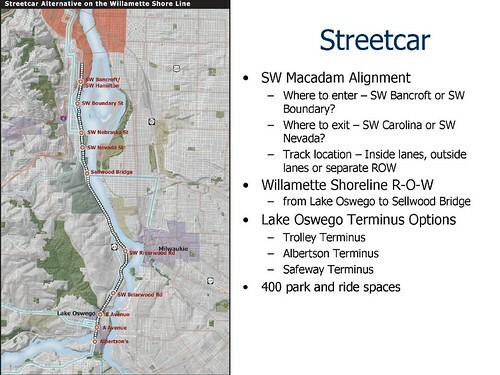 One of the questions the Metro Council posed is whether it would be more effective to reach Lake Oswego via an extension to the Milwaukie LRT line. 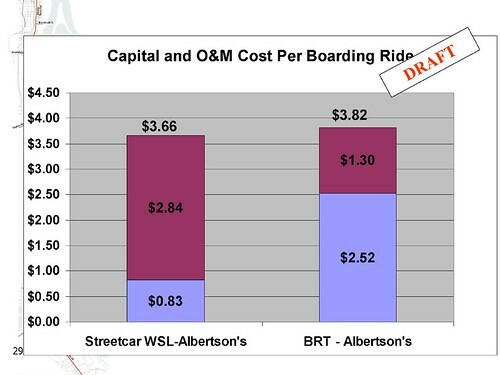 A very preliminary analysis suggests that capital costs would be higher and ridership would be lower. 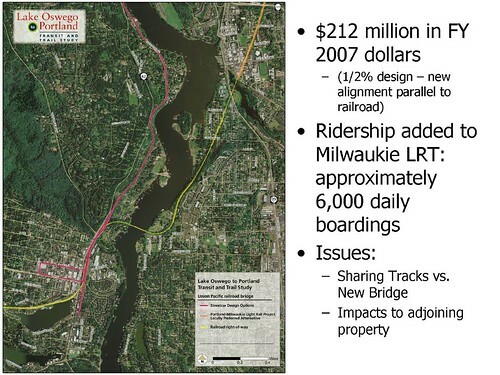 However, operating a DMU-type commuter rail service on the existing rail bridge may have some potential. Streetsblog reports on a Natural Resources Defense Council publication (PDF, 129K) that puts Oregon among the top 10 states for reducing our dependence on oil. I’m not sure it’s nearly good enough. An article in today’s Daily Journal of Commerce looks at whether getting Mississippi Avenue’s sidewalks to the recommended twelve feet will come at the expense of property owners who are redeveloping, or will come out of a perhaps over-wide street.